Deciding which countries to invest in is an important decision, and there are certain relationships that tend to identify those that are more likely to be successful at the macro level. 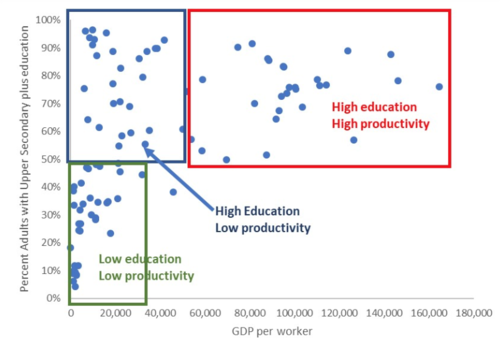 In countries where more than 50 percent of the workforce have upper secondary education there is a strong positive relationship between fixed capital investment and productivity. Countries with an education profile below the defined level do not get the same benefit. GGM is a research and advisory firm helping clients grow profitably in international markets. We believe the only way to understand a market properly is on the ground. Intelligence from our in-country consultants gives you a competitive advantage in China, Asia, Latin America, the Middle East, Africa and other opportunity areas. Our clients benefit from accurate data, reliable insights and strategic advice, giving them the confidence to make better business decisions and succeed in their global growth markets. Enter your work email to receive our free GROW newsletter on international market intelligence and strategy. © 2019 Global Growth Markets. All rights reserved.